This agreement is designed for a doctor's office lease in a multi-tenant building that has retail space on the ground floor of the building. The doctor's office is located on an upper floor of the building. The space is leased on an "as-is" basis, and the rental is adjusted by the CPI every year. This Lease (“Lease”) is made as of _________________, by and between COMMERCIAL PROPERTY LANDLORD, INC., a __________________ corporation (“Landlord”), and AGREEABLE MEDICAL TENANT, INC., a _________________ corporation (“Tenant”). Landlord, in consideration of the rent to be paid and the covenants and agreements to be performed by Tenant, as hereinafter set forth, does hereby lease, demise, and let unto Tenant and Tenant hereby leases and accepts from Landlord that certain office space in the "Building," as defined below, shown and designated on the floor plan attached hereto as Exhibit "A" and incorporated herein by this reference (the "Premises") for the "Term," as defined below, unless sooner terminated as herein provided. The Premises are leased by Landlord to Tenant and are accepted and are to be used and possessed by Tenant upon and subject to the following terms, provisions, covenants, agreements, and conditions. 2.1 Premises. Landlord hereby leases to Tenant and Tenant hereby leases from Landlord the Premises. 2.2 Common Areas. Tenant shall have, as appurtenant to the Premises, the non-exclusive right, in common with others, subject to reasonable rules of general applicability to tenants of the Building from time to time made by Landlord and of which Tenant is given notice, to the use of the following areas of the Building: common entrances, lobbies, corridors, elevators, ramps, drives, service ways, restrooms, and common walkways necessary to access to the Building (the "Common Area"). Tenant hereby agrees that Landlord shall have the right, for the purpose of accommodating other tenants of the Building, to increase or decrease the configuration and dimensions or to otherwise alter the common corridors on any floor so long as Tenant's access to the Premises, restrooms, stairwells, and elevators is not prohibited thereby. Landlord reserves the right from time to time: (a) to install, use, maintain, repair, replace, and relocate for service to the Premises and/or other parts of the building pipes, ducts, conduits, wires appurtenant fixtures, and mechanical systems, wherever located in the Premises or the Building, and (b) to alter, close, or relocate Common Areas or any facility therein. 3.1 Term. The term of this Lease shall be for a term commencing on the Estimated Commencement Date as set forth in Section 1.9 and ending on the Termination Date as set forth in Section 1.10, unless sooner terminated as provided in this Lease. 3.2 Possession. Tenant agrees that if Landlord is unable to deliver possession of the Premises to Tenant on the Estimated Commencement Date, Landlord shall not be liable for any damage caused thereby, nor shall this Lease be void or voidable. Under such circumstances, the term of this Lease shall not commence and the rent and payments for expenses which Tenant is obligated to pay shall not commence until the Premises are ready for occupancy by Tenant and the Termination Date of this Lease shall be based on the Lease Term as stated in Section 1.8 of this Lease, unless such delay is the fault or responsibility of Tenant. If Landlord tenders possession of the Premises to Tenant prior to the Estimated Commencement Date, and if Tenant elects to accept such prior tender, the term of this Lease shall commence on the date Tenant takes possession of the Premises and all of the terms, covenants, and conditions of this Lease, including the payment of rent and other expenses, shall be effective as of such date. Notwithstanding the fact that the term of this Lease may commence earlier than the Estimated Commencement Date, the term of this Lease shall end on the Termination Date set forth in Section 1.10. 3.3 Acceptance of Premises. By taking possession of the Premises, Tenant accepts the Premises in its then "as is" condition and acknowledges that the Premises and the Building are in good and satisfactory condition at the time Tenant takes possession of the Premises. 3.4 Quiet Enjoyment. Upon Tenant's paying the rent and other expenses provided in this Lease and observing and performing all of the terms, covenants, and conditions to be observed and performed by Tenant hereunder, Tenant shall peaceably and quietly hold, occupy, enjoy, manage, and operate the Premises without hindrance or molestation by Landlord during the term of this Lease or by any person or persons claiming under Landlord, subject to all of the provisions of this Lease. 3.5 Security Deposit. On delivery to Landlord of a copy of this Lease executed by Tenant, Tenant shall deposit with Landlord the amount set forth in Section 1.13 as security for the performance by Tenant of its obligations under this Lease. Landlord may apply all or any portion of such security deposit in payment of any obligation of Tenant under this Lease in default. If Landlord so applies any portion of such security deposit, Tenant shall within ten (10) days after written demand from Landlord, restore such deposit to the full amount provided in this Lease. Landlord shall not be required to pay interest to Tenant on such security deposit or to keep such security deposit separate from its general accounts. Such deposit shall be returned to Tenant at the termination of the Lease if Tenant has discharged its obligations under this Lease in full. 4.1 Payment of Rent. Tenant shall pay the monthly Rental, without any prior demand therefor and without any deduction or offset whatsoever, in lawful money of the United States of America, to Landlord on the first day of each calendar month during the term of this Lease as rent for the Premises for such month. Tenant shall make payments of rent and other expenses to Landlord at the Building Manager's office at the Building or at other such address as Landlord may from time to time request in writing. If the term of this Lease commences other than on the first day of a month or ends other than on the last day of a month, the rent for a partial month shall be prorated on a thirty (30) day month, based on the number of days in such month that this Lease is in effect. 4.2 Monthly Rental. The Monthly Rental from the commencement of the term of this Lease through ________________, shall be the Initial Monthly Rental as provided in Section 1.11 hereof. The Monthly Rental for any succeeding calendar year shall be determined by (i) multiplying the difference between the Monthly Rental for the immediately preceding calendar year and $__________ by the CPI Adjustment for such year and (ii) adding to such amount $________; however, in no event shall the Monthly Rental be less than the Initial Monthly Rental. The CPI Adjustment for a calendar year shall be a fraction, the numerator of which shall be the average CPI for the twelve months ending with the September immediately preceding such calendar year and the denominator of which shall be the average CPI for the twelve months ending with the September before the September immediately preceding such calendar year. The term "CPI" as used in this Lease shall mean the Consumer Price Index for All Urban Customers - All Items - U.S. City Average (1967=100 or the then current basis, if changed by the United States Department of Labor) published by the United States Department of Labor, Bureau of Statistics. If the issuance of the CPI by the federal government is discontinued, the Landlord shall use for the CPI the official index published by a federal governmental agency which is most nearly equivalent to the CPI. If no such index is available, then Landlord shall use such index or procedure which reasonably reflects increases or decreases in consumer prices in the United States. If the rental payments determined pursuant to this Section 4.2 exceed that allowed by the terms of any valid governmental restriction which limits the amount of rent or if the rental payments described pursuant to this Section 4.2 exceed any limitation otherwise imposed by this Lease, the amount of rent or other payments shall be the maximum permitted by such governmental restriction and by such limitation; however, all increases or decreases in rent or other payments provided in this Lease shall be calculated thereafter based upon the amount of the rent which would have been payable under the Lease as if such government restriction or other limitation had not limited the rent payable under the terms of this Lease. As used herein "calendar year" means a period ending December 31. 5.1 Additional Expenses Payable By Tenant. Tenant shall pay a reasonable charge determined by Landlord for any utilities or services required to be provided by Landlord by reason of any use by Tenant of any utilities or services in excess of utilities or services customarily provided for general office use in the Building or by reason of any recurrent use of the Premises at any time other than the normal business hours of generally recognized business days and shall also pay any costs reasonably incurred by Landlord to meter or otherwise measure the amount of such utilities or services used by Tenant. Tenant shall pay for any additional or unusual janitorial services required by reason of Tenant's use of the Premises or by reason of improvements in the Premises other than Landlord's "Building Standard" improvements. If the replacement cost of improvements in the Premises in excess of such replacement cost if only Landlord's "Building Standard" improvements were installed in the Premises or Tenant's use or the conduct of business on the Premises or in the Building, whether or not with Landlord's consent and whether or not otherwise permitted by this Lease, results in any increase in premiums for the insurance carried by Landlord with respect to the Building, Tenant shall pay any such increase in premiums within ten (10) days after being billed by Landlord. 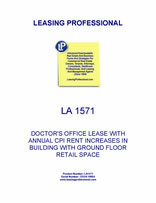 6.1 Services by Landlord. Landlord shall furnish to the Premises during such normal business hours of generally recognized business days such amounts of air conditioning, heating, and ventilation as may be reasonably necessary for the comfortable use and occupation of the Premises. Landlord shall, at all times, furnish the Premises with elevator service and reasonable amounts of electricity for normal lighting and office machines and shall furnish water for lavatory and drinking purposes. Landlord shall provide janitorial service equivalent to that furnished in comparable office buildings and window washing as reasonably required. Landlord shall replace fluorescent tubes and ballasts in Landlord's building standard overhead fluorescent fixtures as required. Tenant shall pay for replacement of all other tubes, ballasts, and bulbs as required. 6.2 Maintenance and Repair by Landlord. Landlord shall maintain the Common Areas of the Building in a first-class condition, shall maintain the plumbing, heating, ventilation, air conditioning, elevator, electrical, and other mechanical systems of the Building in good working order, shall make necessary repairs to the roof and the shell of the Building, and shall repair promptly any damage to the Premises and the Building as provided in Section 10. 6.3 Interruption of Service. Landlord shall not be liable and the Monthly Rental and other payment to Landlord shall not abate for interruptions to the telephone, plumbing, heating, ventilation, air conditioning, elevator, electrical, or other mechanical systems or cleaning services, by reason of accident, emergency, repairs, alterations, improvements, or shortages or lack of availability of materials or services. At any time during the term of this Lease, any utilities or services may be conserved by Landlord without abatement of rent or other expenses if undertaken by Landlord as required by any governmental agency or in a reasonable effort to reduce energy or other resource consumption. 7. USE AND OCCUPANCY BY TENANT. 7.1 Use by Tenant. Tenant shall use and occupy the Premises for general medical office purposes as described in Section 1.16 and for no other purposes without the prior written consent of the Landlord. Tenant shall operate its business on the Premises during normal business hours and shall maintain sufficient personnel on the Premises during normal business hours to receive and supervise visitors to the Premises. Tenant shall furnish and decorate the Premises in a manner consistent with its business and the other businesses in the Building. Tenant shall not do or permit anything to be done in or about the Premises which would constitute a nuisance to the other tenants or occupants of the Building or significantly interfere with their use of any area of the Building other than the Premises. 7.2 Rules and Regulations. Tenant and its employees, agents, and visitors shall observe faithfully the Rules and Regulations attached hereto as Exhibit "B" and made a part hereof, and such other and further reasonable Rules and Regulations as Landlord may from time to time adopt. Landlord shall not be liable to Tenant for violation of any Rules and Regulations or the breach of any provision in any lease by any other tenant or other party in the Building.